There will be no room for more errors for both Ahly and Pyramids FC as they meet in a mouthwatering clash on Friday with the aim of keeping their hopes of challenging Egyptian Premier League leaders Zamalek alive. 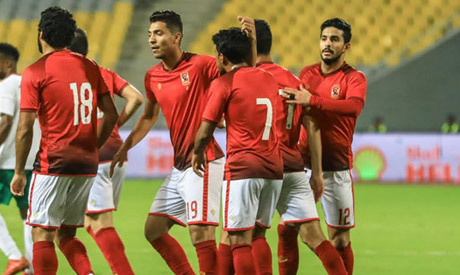 With no love lost between both sides, given last summer's falling-out between Pyramids Saudi chairman Turki Al-Sheikh and Ahly, plenty of excitement could be on display at Cairo's Air Defence Stadium. Al-Sheikh was an honorary Ahly chairman, spending big to bolster their squad before a dispute with the club's administration saw him step down. He then bought the unfancied Assiouty Sport and re-named it Pyramids, splashing the cash on some high-profile recruits, including Brazilian winger Keno who arrived with an Egyptian record fee of $10 million and produced a series of superb displays. Pyramids are hoping they can cause an upset and win the league title while Ahly are seeking to be crowned Egyptian champions for a fourth successive season. However, both have stumbled lately, leaving Zamalek to run away at the top. The White Knights lead the table with 38 points, eight clear of Pyramids. Ahly are sixth on 24 points but can close the gap on their bitter Cairo rivals to five points if they win their three rescheduled matches, including Pyramid's. But with Zamalek producing the form of a would-be champion, Ahly and Pyramids aware that they can ill-afford to drop more points if they are to remain in the race. "The match against Pyramids is important and difficult … and we are determined to win to make up for the [2-2] draw against Dakhleya," said Ahly's interim boss Mohamed Youssef. Youssef will return to his role as an assistant against Pyramids, with new Uruguayan coach Martin Lasarte set to make his debut. Pyramids are managed by Egypt's all-time leading scorer Hossam Hassan, one of Ahly's most prominent stars of all time who caused shockwaves when he moved to Zamalek in 2000. Both sides have also strengthened their rosters with some high-profile January signings, although it is not yet clear whether any of the new faces could play. Pyramids' acquisitions include Ecuador striker Jhon Cifuente while Ahly signed their former prodigy Ramadan Sobhi from English Premier League side Huddersfield Town on a six-month loan deal. Ahly, who looked out of sorts in the draw against Dakhleya, will once again have to play with a makeshift defence, with Malian Salif Coulibaly heading out of the exit door and Saad Samir still nursing an injury.